The cities of Providence, East Providence and Pawtucket Rhode Island, with their paved watersheds, hardened shorelines and industrial landscapes, create significant water quality challenges for the Ten-Mile, Woonasquatucket and Moshassuck rivers, which flow through these urban centers into Providence. All three rivers are included in Rhode Island’s impaired waters list and are major contributors to Upper Narragansett Bay and its water quality issues. Despite these challenges, significant investments in water quality infrastructure like Providence’s combined sewer overflow abatement project, fish passage and other river restoration projects have significantly improved these urban habitats. Further, Rhode Island’s well-developed network of watershed groups is well-positioned to incorporate fish community monitoring activities into its efforts. WPWA technical staff led this project in conjunction with the Woonasquatucket River Watershed Council, Friends of the Moshassuck River and the Ten-Mile River Coalition. Funded by an EPA Urban Waters Small Grant, the Wood-Pawcatuck Watershed Association and the Woonasquatucket River Watershed Council teamed up with the Rhode Island Dept. of Environmental Mgmt. and other partners to develop a fish community monitoring program for Rhode Island’s wadeable urban rivers and streams. Program goals are to assess changes to habitat health, target locations for water quality restoration initiatives, engage community members in citizen science initiatives, and provide water quality information to the public. This project developed the first-ever electrofishing monitoring protocols for volunteers, which were tested and refined with volunteers from urban communities, and established baseline fish community data for three rivers that will be tracked annually to assess changes to habitat health over time. Electrofishing is a safe practice that temporarily stuns fish in order to survey them. This project was part of Watershed Counts, an initiative to develop status and trends indicators for the Narragansett Bay Region. ish were present in each river in spite of their degraded water quality. Today, volunteers and partner organizations are committed to participating in annual monitoring activities for their rivers. WRWC loans out equipment (i.e. 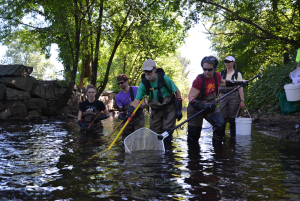 electrofishing backpacks, waders and nets), shares protocols and sample data sheets through its website, and provides technical and training assistance to any organizations interested in fish community monitoring in Rhode Island. ▪ Identifying the small, juvenile fish often captured through electroshocking can be challenging – access to technical experts during monitoring is important. ▪ Although volunteer water quality monitoring is well established, volunteer-led fish community sampling is rare. ▪ Stream monitoring can be carried out successfully with families – electrofishing is best done by adults and high school students. ▪ Local experts are key to help volunteers identify fish and to assist with post-monitoring photo analysis. ▪ Although fish community monitoring can be time consuming, it generates great interest among residents, educators and the media. The Wood-Pawcatuck Watershed Association (WPWA), founded in 1983, promotes and protects the integrity of the lands and waters of the Pawcatuck Watershed in Rhode Island and Connecticut.The Woonasquatucket River Watershed Council (WRWC), established in 2001 following the river’s designation as one of 14 American Heritage Rivers, works to improve the environmental, recreational and economic assets of Rhode Island’s Woonasquatucket River watershed.